Jennifer, my creative landscape gardener who runs one of my crews, has been contacting her clients prior to her last visit of the season to cut the frozen garden down and plant bulbs and asking them “Do you want some WINTER INTEREST in your pots and windowboxes?”. All they have to do is take a look at the different colors and textures of the evergreens we now have in stock and most of them say “Yes please.”. 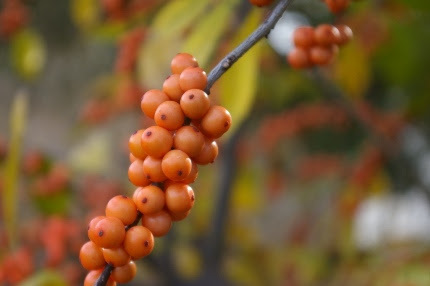 I am harvesting my orange winterberries starting this week and sticking the branches into my porch pots. They simply glow in the sunset light at this time of year. draining. I use clay-like plastic pots on my back deck to avoid this situation. As soon as my summer annuals are frozen, I dig them out and add something new. Just this weekend, I was having company for an outdoor pizza oven extravaganza so I popped in some beautiful purple ornamental kale plants. These will last well past Thanksgiving. The rest of my pots will slowly be transformed over the next few weeks. I will plant baby evergreens, partridge berry (Mitchella), and wintergreen (Gaultheria) and then spray the plantings with WiltPruf. As long as I remember to water these plants in the winter when they thaw out, they should be fine. I will then add them to my permanent collection in my gardens this spring. As November becomes December, I will continue to stud many of the other pots with cut evergreen boughs,colorful branches, and berries. Don’t waste the good soil in your planters. If you have to empty them, use the soil to hill up your roses or put it on your annual/veggie beds. For my large container gardens that are frost proof, I leave the same soil in there from the summer. Come the spring, I remove 1/4 of the soil and dump it in my raised veg beds. Then I add fresh compost and organic fertilizer and mix it all together. Good soil doesn’t go bad, it just keeps getting better. 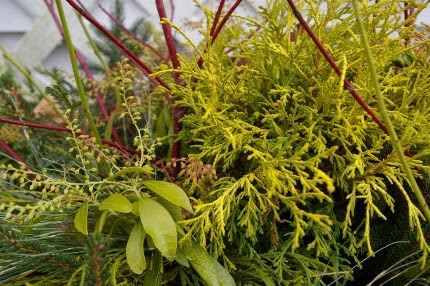 Consider filling your hanging moss baskets and windowboxes with winter interest as well. There are so many inspirational ideas on Pinterest. I love walking around in Chester and other small towns and checking out the various ways the merchants plant their outdoor containers with winter interest. You can use baby pumpkins and gourds up until Thanksgiving, then remove them and add some cut winterberries or birch bark branches in December. You can create charming miniature scenes, complete with mosses and rocks. Let your imagination run free and have fun with this next season of outdoor decorating.